This product has caffeine listed in “other ingredients” but doesn’t state how much caffeine. I ordered a bottle of 100 300mg capsules from a 3rd party vendor (TheSmartShopOnline) and received the order 5 days later. This is when the whole thing started to not feel right from the beginning. First off, I read the label and it states (remember I ordered 100 capsules) “Serving size – 1 capsule/Servings Per Container – 70”. I counted all the capsules and, indeed, there is 100. Then, I got out my scale and found that the capsules weighed anywhere from 325mg – 385mg and an empty capsule weighs 84mg. The bottle also states that it contains “other ingredients”, one of which is caffeine, but the amount is not listed. Why put caffeine in the mix??? 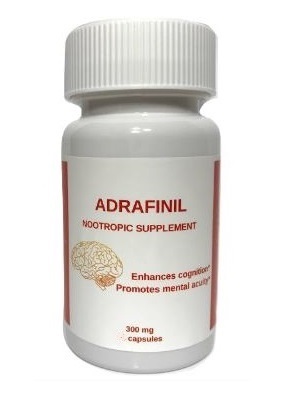 I want Adrafinil. I’m guessing that because of the “other ingredients”, the entire bottle only contains 70 300mg doses of Adrafinil. It says it was distributed by a company named “LS Solutions LLC” out of San Diego. Indeed, there is an “LS Solutions”, but they are in North Carolina and they do not distribute Adrafinil. ALSO, the label lists the company’s address as having the zip code “921137”. Uh… Yeah…There are no zip codes that are six letters long. The address for “LS Solutions LLC” is listed on the bottle as “2701 Midway Drive San Diego CA 921136” which is a POST OFFICE. Lastly… By all intents and purposes this DOES appear to be Adrafinil. HOWEVER, I the poor quality of the label and the lack of information online about this company gives me cause for concern. I’ve only dosed one time, so I will give them a fair chance, and I was quite happy with the price I paid.